Limit time for searching for lost balls to 2-3 minutes. If there is doubt that a tee-shot is lost or out of bounds, please play a provisional ball. If ball is not found within 2-3 minutes, please proceed to provisional ball. Players assistants may, during the course of a round, ask a group to speed their pace of play. All groups will be given one warning for slow play, after which corrective action to include, but not limited to, changing tees being played, being put on clock, skipping holes to regain position, or in extreme cases be removed from course, may be taken. All cases of moving holes or removal from the golf course will be at the sole discretion of the Golf Professional in charge at the time, and rain checks will not be given to groups for holes missed under these circumstances. Deer Creek is a soft spike facility - NO metal spikes allowed. Golf Shoes or Tennis Shoes required. Deer Creek may require a change of shoes if deemed to be harmful to the course. Collared Golf Shirts are preferred. Demin is not allowed when summer rates are in effect. All shirts must have sleeves and must be worn at all times, no cutoffs/tanks will be allowed. Ladies may wear sleeveless golf shirts. Hats are to be worn with bill in front. 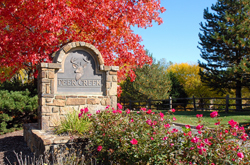 Deer Creek does allow the use of speakers during your round, but must be kept at a level as to not disturb other golfers or homeowners. Outside Food & Beverage not allowed. Bringing outside alcohol onto the Golf Course is against Kansas Alcohol Laws. Outside alcohol will be confiscated.